My old comb after being removed from storage. Now that I finally have some Swarm Trap Plans posted it is time to think about the next step. The traps need to be loaded prior to deployment. The directions for How I Load Swarm Traps can be found under How To… in the navigation bar. I use old broom comb and not everyone is going to have it. Especially if you are new to beekeeping. If that describes your situation don’t just give up. I do think that it increases your chances, so try to obtain some if you can. If you cannot get entire combs small pieces can be rolled into a ball, then rubbed all over the inside surfaces of your trap. I ran out this year and have several traps out with no old comb in them. I have read accounts of people attracting swarms with Lemon Grass Oil, or purchased queen pheromone in the absence of old comb. Once I start having traps occupied I will report my results. If you get it to work let me know. With your permission I would love to have a post of your account. Bees LOVE old comb. If you want to observe this, the next time you have a swarm call, and you have some, take it. I like to utilize this method when I have a cluster of bees that have settled on something and cannot brush or shake them off. If you gently hold the comb against the clustered bees they will begin to crawl all over it. When one side is almost entirely covered place the other side against the cluster. Once both sides are heavily covered place that frame in your box. The first time I witnessed it I was amazed. Questions or comments? Either e-mail or post it in the comments section. 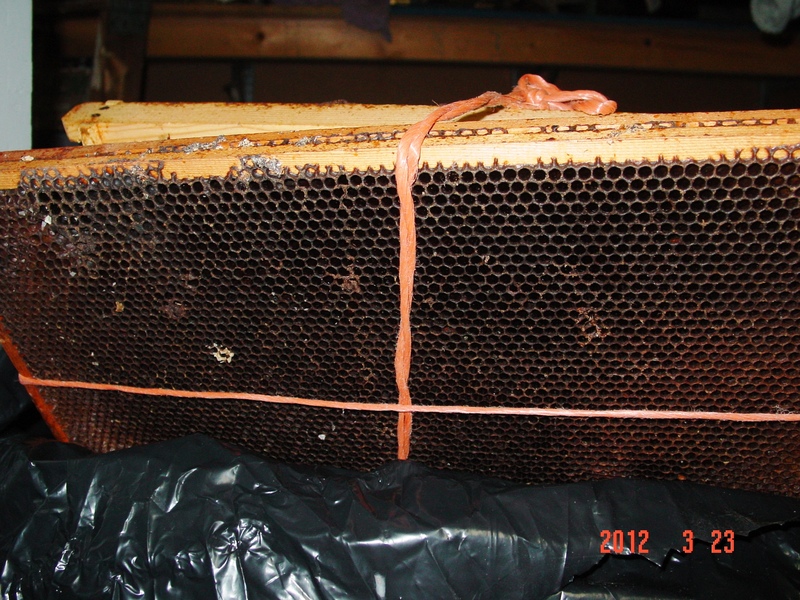 This entry was posted in Feral Bees, HowTo, Posts, Swarm Trapping, Uncategorized and tagged bait hive, beekeeping, feral bees, feral hives, foundationless frames, how to load a swarm trap, Indiana beekepeing, Jason Bruns, loading swarm trap, swarm trap, swarm trapping. Bookmark the permalink. I’m hoping my combination of old comb and swarm lure that I made (lemongrass oil and beeswax) will do wonders for the bee yard. I will happily post a report if it works. You only know if you try. Take notes, duplicate if it works, change something if it doesn’t. I wish you luck and keep me posted!